It's Carnival day in the 2000s. 'Bouyon' music booms from massive speakers in huge trucks laboring through narrow streets. In tow, thousands of revelers are 'chipping' to the insistent, amplified, hypnotic beat. The core conveyor of music is the hi-fi -- it's the veritable 'new face' of carnival revelry. Gone are the days when 'lapo kabwit' drums and steel pans were main sources of music on carnival day. Steel pan virtuoso Atherton Martin saw this as a sad reality as he reflected on the rise and fall of the steel pan in Dominica. Martin said the steel pan was introduced here in the 1950s after World War II. Pan caught on quickly and fit as it fit in neatly with the lapo kabwit drumming tradition. Also, playing pan required no formal music training, and pans were built and tuned on island. By the 1960s, a strong community movement to play pan and join steel bands emerged, driven by 'grassroots' people's passionate support for the quintessential West Indian musical instrument. "There were fans . . . there were people who provided whatever the band needed … it was the community that literally owned and supported the steel pan…" Martin recalled. By 1962, there were over a dozen steel bands across Dominica and pan dominated the streets at carnival when bands of skilled 'pan-ists' drew crowds as large as the bouyon bands do today. Martin started playing pan at the age of 12, like most youths of his era. "All of us played sports, all of us played steel pan…If we were not doing sports, we went into the pan yard," he said. For a while, the pan culture flourished, Martin said, and two secondary schools made teaching pan a part of their curricula. To him, this had mixed results. On the plus side, Martin said, it provided a structured environment within which the instrument was learnt. But he feels it also took steel pan out of the community and into the school which slowly eroded pan's grassroots appeal. There was also a drive to formalize the steel pan movement and organise steel bands, Martin said, which led to the formation of an association and the pursuit of sponsorship. "When those things work, they are beneficial; when they don't work they tend to de-energize people because they create an expectation of dependency," he said. As he recalled, a culture of dependency soon arose, which he said caused "people depend on the pan association to do things that the band themselves would normally have done". Additionally, carnival began to be more Roseau-based, he said, creating challenges for rural steel bands because it is difficult to transport the unwieldy instruments. Later, when a 'Panorama-style' competition was introduced, rural bands were at a disadvantage and tended to be eliminated early as their pan-ists were outshone by better-trained urban players. This discouraged them, Martin contended, and in the long run mounting challenges faced by players in outlying communities caused interest in steel bands to wane. Large-scale migration of young Dominicans also shrunk the local skills-pool of pan players, builders and tuners. But the real clincher in the decline of pan, Martin believes, was the introduction of electronic bands with deejays on trucks. "And because they had a lot more volume than the steel-band, they were always able to overcome the sound of the steel band so revelers….started following those bands . . .
"The steel-bands were only left with the diehard supporters, so they were a lot smaller, a lot less attractive. . . eventually the steel band players themselves got discouraged," Martin said. "You need to have better players and more players to compete with electronic music; you needed the steel-band to operate throughout the year," he declared, adding that this is expensive. 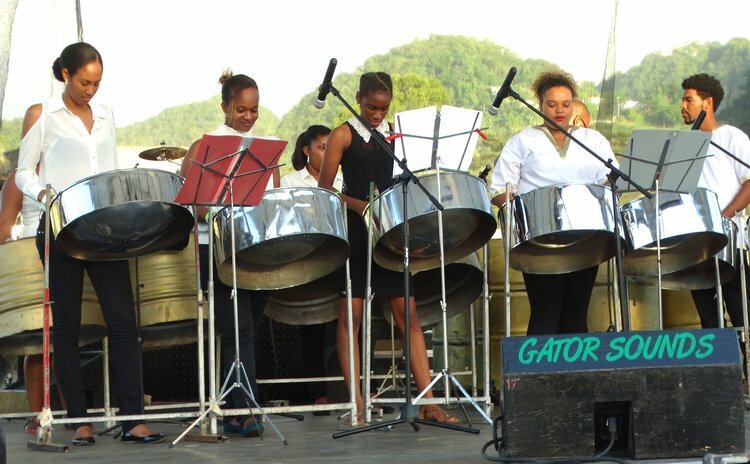 Efforts to get sponsors were unsuccessful and the situation reached a stage where the steel pan was dormant for nine to 10 months of the year, only to be revived briefly for carnival. Now, there are only a few groups trying to keep local steel pan music alive and the steel band movement has nearly disappeared. He pointed out that the basic building blocks to revive the steel pan do not exist and, in fact, the last revival attempt required importing pans from Trinidad as no one could make them here. He disclosed that for some time there were only two persons in Dominica who could build and tune steel pans, but one of these persons died and the other is ailing and cannot continue the craft. Martin underscored the importance of investing in pan tuners, builders and tutors, without which all pan-revival initiatives will fail. "Steel band has a whole history and a culture of community engagement . . . that has to be recognized . . . you have to work to rebuild steel band at the community level," he contended. He recommends introducing pan at the primary school level to build a corps of competent pan-ists. But this requires money, and Martin does not think there is genuine understanding of pan and the correct approach that should be taken. He said national investment in steel pan tuition is crucial because it inculcates discipline, persistence and a sense of teamwork, while sharpening youths' minds and keeping them productively engaged.